Dr. John Walker and the team at Walker Orthodontics PC near Littleton, MA are orthodontics experts and can help explain to you why you should always maintain good oral health by brushing and flossing your teeth while wearing braces. We’ve all been taught about the importance of brushing and flossing our teeth, typically in the morning when you wake up and at night before you go to sleep. But the one thing that you should never forget to do is clean your teeth properly, especially if you wear braces. While wearing braces, whether you’re a teenager or an adult, maintaining good oral health care Walker Orthodontics helps ensure a successful treatment outcome. • While brushing your braces on and around your top teeth, make sure to brush them with the toothbrush angled downward. • When brushing your braces on and around your bottom teeth, make sure you brush them with the toothbrush angled upward. Dr. Walker stresses that cleaning your mouth, teeth, and braces effectively is an important part of your orthodontic treatment. If you don’t put the effort into your cleaning regimen while you are wearing braces, you may not get the outcome that you were hoping for: a clean, healthy, straight, white smile. • Thread the floss under the wire before passing the string between the teeth. • Rub the waxed floss up and down each surface of the tooth and don’t skip cleaning each and every gap. 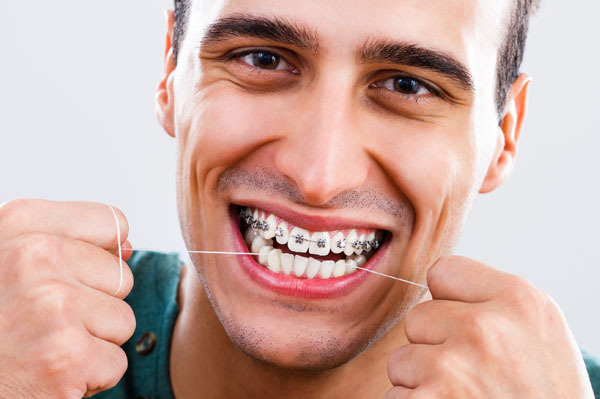 • Weave the floss through the individual gaps between the teeth (no blood should be seen. If you see blood, you may need to floss a little more gently). • Be sure to massage the gums with your toothbrush during brushing. • Finish things off with a good and thorough mouthwash rinse.